Dave: Do you remember your first visit to New York? Did you come as a school girl? Did you come for a gig? What was your first time here in New York City? Dolly: Actually, the very first time I was here in 1964. I came here on a senior trip from the Smokey Mountains. We had made up our money and it was the year that the World's Fair was here. And Hello Dolly!was in town. Just these little country kids from the mountains, all over the cabs, all over the subways, it was Hello Dolly! I thought "they knew I was comin'!" so I rubbed that in real good on all my friends and and so now, here's Dolly, I'm back! She went on to talk about opening night, this Thursday, the 30th and said that Lily Tomlin and Jane Fonda will walk the red carpet. 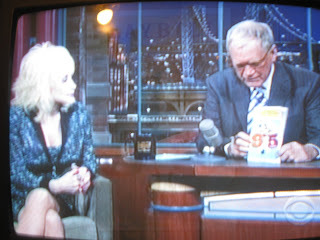 She also sang "Backwood Barbie," which she said is the first song she wrote for 9 to 5: the musical. Megan Hilty sings it in the show. I saw her on Letterman. That was a great story!